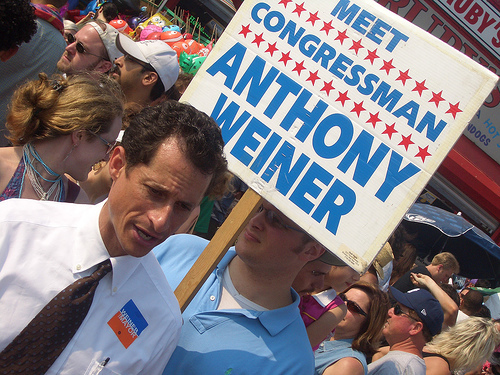 Representative Anthony Weiner may be fighting for his job (not to mention his marriage) after making a complete idiot of himself on Twitter, but he's hardly the only who has gotten into trouble on the social media site. Plenty of brands and business people have used the openness and informality of the micro-blogging service to hang themselves as well. So aside from Weiner, who in the business world has gotten confused about the different between a DM and an @ reply or simply let too much slip and found themselves shamed on Twitter? And what can other organizations learn from their errors that can help them avoid future humiliation on the site? PR flacks are meant to be the ones protecting executives and celebrities from themselves on social media, but sometimes it's the PR pros themselves who get their companies into hot water. Earlier this year when the New York Times called out G.E. for using aggressive accounting to avoid paying any federal taxes, journalists at Business Insider got in touch with the company's PR people over Twitter to see if the story was accurate. Did GE's public relations reps quickly clear up any confusion about the company's tax liability? No. Instead obfuscations and lengthy silences muddied the waters further, proving the company had something to hide and leading Business Insider to conclude "that @GEpublicaffairs had probably just been shamelessly spinning." Takeaway: As Business Insider put it, "let this be a lesson to you, corporations who view Twitter as a fantastic tool for spinning, once you assert something on Twitter and then go silent when you are asked simple questions about it, the folks you're trying to snow are going to conclude that you're just trying to spin them. And they're not going to like it." Catastrophe is a strong word, let's all agree to call it a whoopsie daisy. Could BP have done anything to stop the hilarity? Short of having the foresight to sit on the Twitter handle before the spill, probably not much beyond insisting the satirical account make clear it was an unofficial parody (which BP did). Fighting enraged environmentalists and local citizens would only have only further increased the company's reputation as callous and out of touch. Takeaway: Sometimes, Twitter embarrassment is only the symptom of a deeper problem (no pun intended). Fixing the real issue beats throwing a hissy fit. VodafoneUK: Do You Know Who is Tweeting? When it comes to employees accidently posting personal messages on the company Twitter feed, Chrysler may have thought it had it bad when a worker sent out the following tweet: "I find it ironic that Detroit is known as the #motorcity and yet no one here knows how to f---ing drive." But at least most people can sympathize with a bit of road rage and the company quickly apologized for the incident and promised to take measures to prevent a repeat. Far stranger and far worse was this beauty from official telecoms company @VodafoneUK: is fed up of dirty homo's and is going after beaver. Obviously, a storm of retweets followed. And so did a quick and angry termination of the guilty party. Takeaway: Have the people who have access to your account been carefully vetted? Are any of them nursing a grudge? Now might be the time to find out. "Millions are in uproar in #Cairo. Rumor is they heard our new spring collection is now available online at (link)." If you're in the fashion business, the least you're expected to do is show a little taste and by this measure alone, Kenneth Cole's tweet was a spectacular fail. Justifiable condemnation rained down on the brand, which apologized. Takeaway: Twitter is a relatively informal medium where jocularity often pays and stiffness is rarely rewarded, but there's a flip side to needing to seem like a human rather than a corporate drone. Loosen controls enough to get a genuine voice on the site, and there's much greater scope for error and poor judgment. Rapper 50 Cent's Twitter scandal appeared to be an update of that tried-and-true stock scam – the pump and dump. The musician took to Twitter in January to urge his millions of followers to buy stock in a miniscule company in which he was heavily invested. "HNHI is the stock symbol for TVG there launching 15 different products. they are no joke get in now," ran one such missive. Predictably the stock price shot up, earning 50 Cent $5.2 million on paper. Only by failing to actually 'dump' the inflated assets did the rapper avoid an investigation. Takeaway: Don't use your Twitter stream for any activities that can get you investigated by the SEC. When Ketchum VP James Andrews (@keyinfluencer) went to FedEx headquarters in Memphis to meet with his client there, he used the opportunity to tweet his feelings on the town. "True confession but i'm in one of those towns where I scratch my head and say 'I would die if I had to live here!'" FedEx didn't appreciate his candor or his comment and a mini firestorm erupted in the blogosphere (including here on BNET). Andrews apologized and explained that the tweet was in response to "an intolerant individual," rather than the city as a whole. Takeaway: FedEx let it go but the incident proves once again that the lightness and personal feel of Twitter only extends so far. Even if it's your personal account, as a high profile individual, be wary.